BERKELEY, CA � Researchers at the Department of Energy�s Lawrence Berkeley National Laboratory (Berkeley Lab) have developed a new high-performance, energy-efficient table lamp that is designed to save energy in homes and offices while greatly increasing lighting quality and visibility. "Widespread use of this lighting system in offices and homes could greatly reduce the current power problems we have in California while increasing the quality of the lighting environment," says Michael Siminovitch, a scientist in Berkeley Lab�s Environmental Energy Technologies Division. "To our knowledge, nothing currently available in the office, hospitality, or residential marketplace has both the high-performance lighting quality characteristics and energy efficiency of this new lamp." At full power, this two-lamp fluorescent system matches the combined luminous output of a 300-watt halogen lamp and a 150-watt, incandescent table lamp while using only a quarter of the energy. Berkeley Lab is working with the Sacramento Municipal Utility District (SMUD), Southern California Edison (SCE), and Pacific Gas and Electric (PG&E), to acquire and field-test the first production lamps based on the new high-performance design. The new lamp uses two independently controllable and fully dimmable compact fluorescent lamps (CFLs). One lamp�s light is directed downward, illuminating the table or desk. The other directs light up toward the ceiling, providing high-quality indirect lighting. An optical "septum" separates the two lamps, allowing three modes of lighting: downward lighting only, upward only, or up and down together. The relationships between the lamps, the septum and the lamp shade have been designed to maximize the efficient distribution of light as well as to provide soft and even shade brightness. Staff Research Associate Erik Page says, "This lamp is clearly an energy saver in homes, but it is also a great energy-efficient alternative in office spaces. Substantial savings can be had by turning off overhead room lighting altogether and using this lamp. The "down" light gives the user more than enough flux (light output) for most tasks, while the "up" light provides a low-glare ambient light that is ideal for computer environments." The lamp was designed by the same Berkeley Lab research group that developed the compact fluorescent lamp-based alternative to the dangerous and inefficient halogen torchiere, that has been proven to be a fire hazard. Lamp features were designed to enhance lighting quality and user visibility particularly in office applications with computer tasks. These features include providing a level of flux that is significantly greater than traditional task lights. "As people age, they need more light to comfortably perform visual tasks. This lamp caters to that need," Page adds. The fully dimmable and controllable lights allow for maximum flexibility by enabling the user to adjust the lighting system to a changing environment. The dimming option increases energy savings by allowing users to reduce power when they need less light. The lamp also produces a more uniform light, reducing the harsh "hot spot" effect produced by halogen lights and some CFL designs. 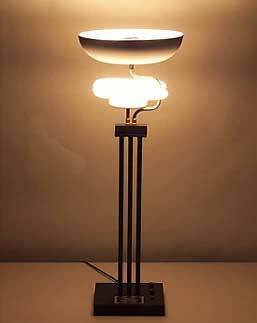 Berkeley Lab researchers and the three California utilities are in the final stages of selecting manufacturers to produce the first 600 prototype table lamps. The utilities will place these lamps in offices, residences and hotels, monitoring energy use and customer satisfaction in an upcoming demonstration program. Berkeley Lab has a patent pending on the new design. For more information contact Berkeley Lab�s Technology Transfer Department: [email protected] or (510) 486-6467. This research and development project was funded by the U.S. Department of Energy's Office of Building Technologies, State and Community Programs, with additional support from the California Energy Commission. Berkeley Lab is a U.S. Department of Energy laboratory located in Berkeley, California. It conducts unclassified scientific research and is managed by the University of California.